Want to add warmth and beauty to any room in the house? You can with hardwood flooring from our reputable flooring store. Nothing compares to the uniqueness, beauty, and ease of cleaning of hardwood flooring. It makes any room feel welcome and attractive. Whether you are planning to move into a new home or are about to start a renovation, you can count on us to deliver quality flooring at affordable prices. Speak with one of our sales associates and transform your home today. Our showroom features many well-known flooring manufacturers, as well as a vast selection of wood types, patterns, and finishes. What can we offer if you want this majestic flooring option? Our flooring store offers a full selection of high-quality engineered, solid, and handscraped hardwood floors at affordable prices. Many different designs, styles, and colors are available to suit whatever you want. With many hundreds of stores in our network, we use our significant buying power to your advantage. See for yourself when you visit our store, and start the process of creating a whole new look in your home. The designs and qualities of hardwood flooring never go out of style and, better yet, never need updating - no matter what your choice of style. With an abundance of character and an elegant look for even the most basic room in the house, you are destined to find what you are looking for when you shop with us. Strip Flooring - Adds a traditional look while making the space seem larger. Strip flooring comes in strips that range from 1" to 2.5" and in thicknesses of 5/16" to 3/4". Plank Flooring - With wider strips from 3" to 8", plank flooring is noted for its earthy appeal and complements a room that is decorated with antiques or historical items. Handscraped Flooring: Trending today, handscraped flooring offers a timeless appeal that is enhanced by the advanced urethane finishes. Wire-Brushed Floors: As charming a style as any, but with a quieter application that gives it a rustic, distressed look. It is enhanced with urethane finishes for durability and spill-resistance. Engineered hardwood combines durability with timeless beauty. Establish a distinct presence in any room with this flooring option. Engineered hardwood is composed of a durable wood core and layers of hardwood that have been treated with resilient finishes. The result is a natural-looking floor that is tough against heat, moisture, and warping. Available in a wide variety of styles, types, and colors, engineered hardwood is a versatile option for high-traffic areas like kitchens and bathrooms. It is also ideal flooring for basements. Establish a timeless atmosphere throughout your home with handscraped hardwood flooring. Handscraping is a process that textures each individual plank to give the flooring an aged or distressed look. Thanks to today’s strict manufacturing processes, handscraped hardwood flooring combines modern engineering with classic artistry and craftsmanship. Handscraping is available in a wide variety of styles and finishes, much like our other options. As a result, your flooring may be completely customized to match the look you want. Hardwood floors invite warmth and elegance, along with a natural-feeling ambience, into any room of your house - including the basement. Nothing compares to the ease of cleaning and the physical beauty of hardwood. In addition to our all-star team of sales professionals, we also offer hardwood flooring installation from experienced and trained professional installers. Our flooring installation technicians can deliver and install any selection of flooring to complement any room in your home. You deserve a new floor that matches your high standards. For this reason, our sales and installation team work hard to deliver the hardwood flooring you want at prices you can afford. During your in-depth consultation, our sales associate helps you pick out the flooring type and design that best matches your renovation goals. 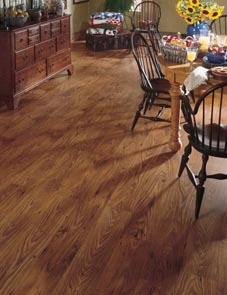 Then, at your convenience, our installers come directly to your location and place your new floor. Have confidence knowing that your new floor is being handled by professionals. Our installers have the training, equipment, and experience to complete every step of your hardwood flooring project. We will even remove your old carpet, tile, or wood flooring and dispose of it for you. To us, our work is not complete until you are completely satisfied. We are available to install your floor, according to your exact specifications. Each hardwood flooring installation is backed by a lifetime guarantee, so if you find anything wrong with your investment, we will return and make it right at our expense. We confirm that promise to you when you choose your quality product and enjoy the excellent service we provide. Find the hardwood flooring of your dreams with a sense of confidence and satisfaction that can't be beat.